Becoming a professional dj or performer on the road was never that easy. Keep your music setup always in your pocket. We care about simplicity, reliability and innovation. All included features gives all whats needed to start as a beginner or use SamplePad as professional. Feel like in the studio with warm, analog look of the application. Using the app feels like working with analog tools. Advanced algorithms enables same high quality sound like with other more expensive tools. Audio engine is capable to use samples with 24bit depth. Advanced but simple to use settings and features lets you adjust enough to personalize your style and enables you possibility to play your perfect live-act. You can use the app on different phone and screen sizes. Application adjust it's user interface also to tablet devices. You can use one app on two different deivces at the same time. We are always open for your feedback. Contact us and ask about the SamplePad. Propose us your ideas and share your positive experience about the app. We developed the to fill gap in the market. There was nothing like SamplePad in the market and we gave a lot of love developing the product. Hope you will love it too. SamplePad is easy to play live music for everyone. Check out our feature presentation on the video. You will learn the basics about the features and how to load your on samples directly from your computer - no cloud synchronization needed. "Application is well designed and it's user interface lets you do a lot of cool things with sounds. I really liked the effect section with echo, rever or filtering. Big plus for really innovative features. I'm waiting for more in-app purchase sample packs to task more great sounds!" "This something fresh. 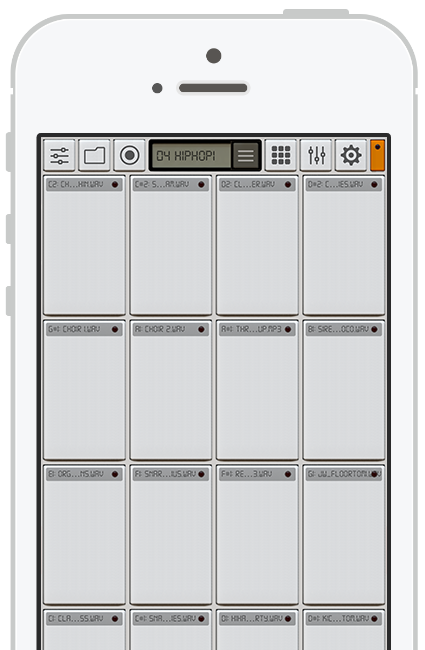 I used to use Novation LaunchPad app or iMaschine, but this is something different. It lets you be more creative and lets you really prepare your set for live concerts. You can prepare you sample set for 1h and be able to play it continously live." "Awesome app. I ve been looking for good sample pad for months. The best thing is possibility to send your own samples using a cable straight from mac or PC." SamplePad is an app which lets you play music live professionally using only your mobile device. It's designed with fresh ideas and simplicity. We hope you will love it as we do!